Your doctor may want to investigate how your heart responds to exercise. This may be because you have told him that you are experiencing chest pain or breathing problems when you are walking. It is also possible that if you have previously received treatment for blockages in the arteries of the heart with stents, or had a coronary artery bypass operation, this test can be used to assess how successful your treatment was. 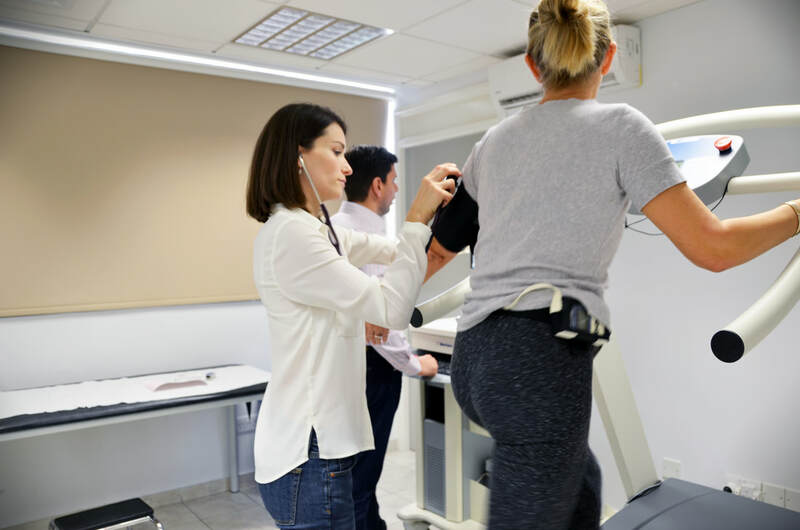 The exercise stress test will provide the doctor with essential information in the assessment of your symptoms or previous treatment. You will be guided by the doctor and his staff to the exercise test room. You will be provided with a changing area where you can put your belongings and clothes. Initially, it will be necessary to remove your shirt or blouse in order for the wires to be attached. We will initially prepare your skin by wiping it with a cleansing wipe, before attaching a series of electrodes (stickers), similar to when you had your ECG test. You will then be given a gown to wear. The doctor will record your ECG again whilst you are resting, and record your blood pressure. You will then be asked to step up onto the treadmill, and be given a hand rail to hold. For some people it is their first time walking on a treadmill, but after a few steps usually find that is quite comfortable. During the time that you are walking, the doctor will continuously monitor your heart's activity. The doctor will gradually increase the difficulty of the test, but at any point you wish to stop, he will slow the treadmill down. If you can carry on, the doctor will stop the test once he has enough information, which is not usually more than eight minutes of walking. Once you have stopped walking, the doctor will continue to monitor your heart whilst you recover. Once he is satisfied, he will remove the electrodes from your chest and provide you with a towel in order that you may get dressed. You will then also be provided with a light refreshment whilst you discuss the results of the test with your doctor. If you need to have any other tests, he will discuss it with you at this time.